His second CD, Symphonic Poem, presents Cheung’s own compositions, and was released at the Percussive Arts Society International Convention in 2009. 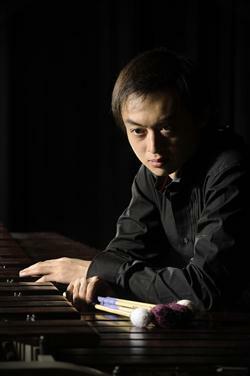 As a composer, Mr. Cheung’s Three Etudes won First Prize in the Classical Marimba League’s Competition in 2007. He has also composed a Concerto for Marimba and String Orchestra, and collections of preludes, etudes and sonatas. He served as a judge for the 50th Percussive Arts Society Composition Competition. Mr. Cheung’s exciting engagements this season include an appearance as concerto soloist with the Hong Kong Philharmonic Orchestra performing “Colours of Crimson” by Bright Sheng. He gives a solo recital at the prestigious Morgan Library and Museum in New York. Other concerts are in NYC’s Washington Square Music Festival, at the Library of Congress in Washington DC, and the Manchester Music Festival (VT). After winning the 2008 Young Concert Artists International Auditions, Mr. Cheung made his New York solo recital debut in the Young Concert Artists Series at Carnegie’s Zankel Hall, his Kennedy Center debut in Washington, DC, and at the Isabella Stewart Gardner Museum in Boston. As recipient of the Usedom Music Festival Prize, he was engaged to perform at that Festival in Germany. Mr. Cheung has appeared as concerto soloist with the Philadelphia Orchestra as winner of their annual concerto competition at the Kimmel Center, performed Creston’s Marimba Concerto with the Simon Sinfonietta (MA) and with the British Columbia Chamber Orchestra and Vancouver Metropolitan Orchestra in Canada. He has performed marimba recitals at the Boston Public Library, the University of Georgia, the Colonial Theatre (MA), The Paramount Theatre (VT), Jordan Hall in Boston, at Stratford Summer Music in Canada, in Denmark, Croatia, and at the Hong Kong Arts Festival. An inspiring teacher to young percussionists, Mr. Cheung has given Master Classes throughout the U.S including NYU, the Juilliard School, and the Curtis Institute of Music, the Amsterdam Conservatory, and the Paris Conservatory. Mr. Cheung moved from his native Hong Kong to Vancouver at the age of 12. He received his Bachelor of Music from the Curtis Institute in Philadelphia, his Artist Diploma from The Boston Conservatory, and his Doctorate from the University of Michigan. Mr. Cheung currently holds the post of Assistant Professor of Percussion at the University of Oregon. He is a Yamaha Performing Artist and Innovative Percussion Artist. Currently serving as Assistant Professor of Percussion at the University of Oregon, Dr. Pius Cheung is widely known as a master soloist on marimba.